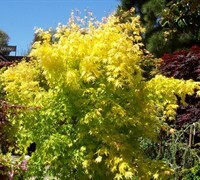 An absolutely beautiful tree with vivid coloring spring through fall! 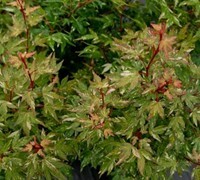 Growing to about 12 to 15 feet in height with about an 8 foot spread, the Orange Dream Japanese Maple is an upright grower with wonderful yellow leaves that have orange margins in spring. The leaves slowly fade to a bright lime green color by early summer. In fall the leaves revert back to the spring color but with more orange. Orange Dream is best with protection from hot afternoon sun. 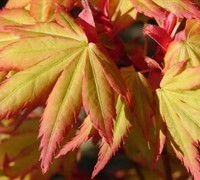 When provided the right environment in the landscape Japanese Maples are very easy to grow. Sun - Some varieties will tolerate full sun. However, in their natural habitat, Japanese Maples are understory trees, growing in dappled forest sunlight and at the edges of partially shaded woodlands. Ideally they prefer to be grown in similar conditions. In Ground: Dig a hole no deeper than the root ball and two to three times the width of the root ball. Fill it with water. If the hole drains within a few hours, you have good drainage. If the water is still standing 12 hours later, improve the drainage in your bed or establish a mound to plant your tree in. Turn and break up the soil removed from the hole. If the native soil is dense or compacted amend with compost or soil amendment at a 30/70 or 50/50 ratio. Remove your plant from its container and carefully loosen the roots around the exterior of the root ball. Set the plant into the hole you've prepared making sure the top edge of the root ball is slightly above the soil level (1/3 of the rootball above the ground if planting on level ground) to allow for settling. When backfilling tamp as you go to remove air pockets. When planting on level ground, and your rootball is higher above the ground, taper your backfill soil mixture from the top edge of the rootball gradually towards the grade. Water thoroughly and cover with a one- to two-inch layer of mulch. Then, during the first year or two, water as needed to ensure soil stays moist but not consistently wet. In Containers: Pick a container that will match the mature size of your tree and that has drain holes. Use a well-draining planting or potting soil. Do not use native soil.